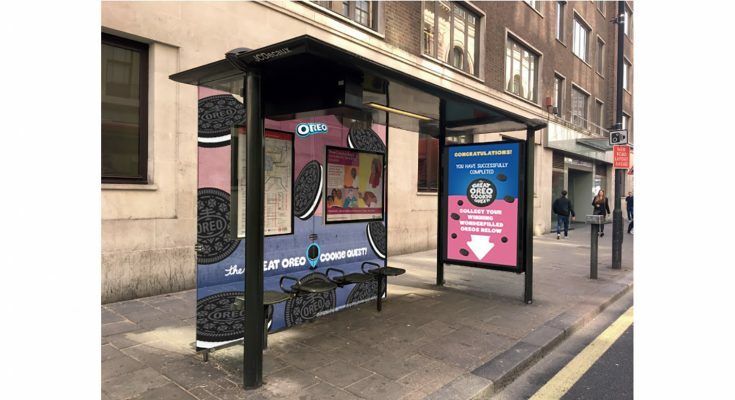 Oreo, the world’s biggest-selling biscuit brand, has launched an innovative Out-Of-Home (OOH) campaign across London to drive purchase and participation in its 2018 Great Oreo Cookie Quest promotion. The core of the OOH campaign is a specially built, interactive digital poster within a fully wrapped bus shelter on London’s busy New Oxford Street. It offers passers-by the opportunity to find hidden cookies in a version of The Great Oreo Cookie Quest game and win a free pack of Oreos, dispensed directly from the poster site. The new OOH campaign runs for two weeks across 245 panels and 10 Transvision screens in rail stations across London, featuring a variety of creative executions directing people to the New Oxford Street game and encouraging purchase in-store. The OOH game comes complete with its own bespoke mobile interactive game with location-based targeting around the dispenser to lead users to the OOH site and encourage participation in the quest. OOH campaign planning is by location marketing specialist Posterscope and Carat with creative produced by Liveposter and is part of a wider advertising campaign that includes TV, online and in-store activity and displays. The Great Oreo Cookie Quest, which launched in the UK in mid-January and which runs until 31st May 2018, is effectively two promotions. One, an instant win on-pack promotion, offers customers the opportunity to win the grand prize of a once-in-a-lifetime trip to California for four people, with a visit to the Googleplex and spending money. Other instant win prizes include 780 Bluetooth compatible speaker – (up to 39 will be awarded each week) worth £13 and 1,320 Oreo Earphones (up to 66 will be awarded each week) with a value of £3. Consumers have to buy a promotional pack (unless they live in Northern Ireland, where there is a No Purchase Necessary route to conform to local gambling laws). If they are using a computer, they then go to the promotional website, www.oreoquest.com; if they are using a mobile device, then they can download the “Oreo Quest” app from the Google Play Store or the App Store and tap on the “Enter CODE” button which will take them to the promotional site. They are then asked for their details and have to upload a scan of the logo from the pack or of an Oreo, plus their pack code. The second promotion involves using the Oreo Quest app to find hidden Oreo Cookies and dave them to a ‘Cookiedex’. These cookies can be found by solving daily clues, identifying the object involved and then scanning it using the app, or by scanning random objects. Daily clues will involve riddles such as “What puts hands on your wrist?” if users then scan a watch, an Oreo will be revealed on their phone screen. There are 30,000 £5 Google Play vouchers to be won by collecting cookies and scoring points, and one grand prize of a Samsung Galaxy J7. The hidden cookies are worth different points depending on their colour – one point for chocolate, three points for silver and five points for gold. A maximum of 390 cookies can be stored in the ‘Cookiedex’ and the Galaxy J7 will go to the user who collects the biggest point total. The £5 vouchers can be won by players who are among the first to reach particular scores. Players can also earn Oreo wallpaper and stickers to use in their messaging apps. The Great Oreo Cookie Quest app plays on Oreo’s partnership with Google, which began in August 2016, and which is why the prizes are Google Play vouchers and an Android phone (the Samsung). It has elements similar to that of the hugely popular Augmented Reality game “Pokemon Go,” where users search for virtual Pokemon in their surroundings and catch them storing them in a Pokedex on their phones. The Great Oreo Cookie Quest app was created by US ad agency The Martin Agency, in partnership with Carat and US AR developer Gravity Jack. 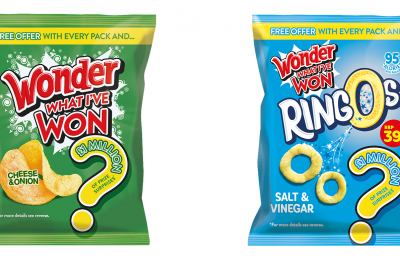 It launched on iOS and Android at the end of January in the U.K. and will roll out across Europe, Russia, Latin America and possibly the U.S.
Mondelēz International is a global snacking company with 2016 net revenues of approximately $26 billion. Mondelēz is a world leader in biscuits, chocolate, gum, candy and powdered beverages, with power brands including Oreo and belVita biscuits; Cadbury Dairy Milk and Milka chocolate; and Trident gum.